30 CEMENT AMERICAS • Spring 2018 • www.cementamericas.com FEATURE I n industries that produce powders and bulk solids – such as the cement industry – controlling moisture content can impact purchase price, shipping costs, material han- dling and perhaps most importantly, the quality of the final product. When processing dry bulk solids such as food ingredients, chemicals, pharmaceuticals, pigments, minerals, etc., the amount of moisture in the product can have a wide range of effects. A product's quality, as well as transactions based on weight, can be adversely affected by improper moisture contents. Furthermore, the satisfaction of legal requirements that are present in many industries is a determining factor influ- encing a company to measure moisture content. However, until recently conducting frequent moisture con- tent tests throughout the process or in the field has been difficult. In many cases, the primary barrier has been the expertise and time required to conduct such tests. Often sophisticated moisture measurement devices must be operated by trained personnel that can properly cali- brate the equipment. Many also require meticulous sample preparation and disposal. Fortunately, handheld devices are now available that allow even less-skilled personnel to take lab-quality moisture measurements. These "point-and-measure" options allow moisture readings to be quickly taken at any stage of the process, as well as at loading docks, on trucks, at suppliers, or in bins, vats or vessels. By simplifying the process, powder and bulk solid producers can increase the quality of their products from raw material receipt and formulation to end product manufacturing and distribution. 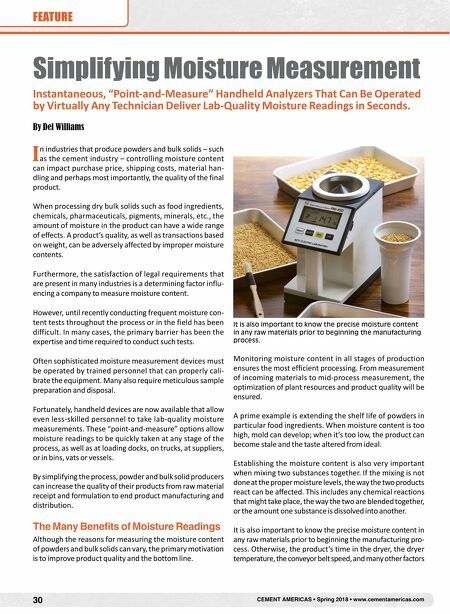 The Many Benefits of Moisture Readings Although the reasons for measuring the moisture content of powders and bulk solids can vary, the primary motivation is to improve product quality and the bottom line. Monitoring moisture content in all stages of production ensures the most efficient processing. From measurement of incoming materials to mid-process measurement, the optimization of plant resources and product quality will be ensured. A prime example is extending the shelf life of powders in particular food ingredients. When moisture content is too high, mold can develop; when it's too low, the product can become stale and the taste altered from ideal. Establishing the moisture content is also very important when mixing two substances together. If the mixing is not done at the proper moisture levels, the way the two products react can be affected. This includes any chemical reactions that might take place, the way the two are blended together, or the amount one substance is dissolved into another. It is also important to know the precise moisture content in any raw materials prior to beginning the manufacturing pro- cess. 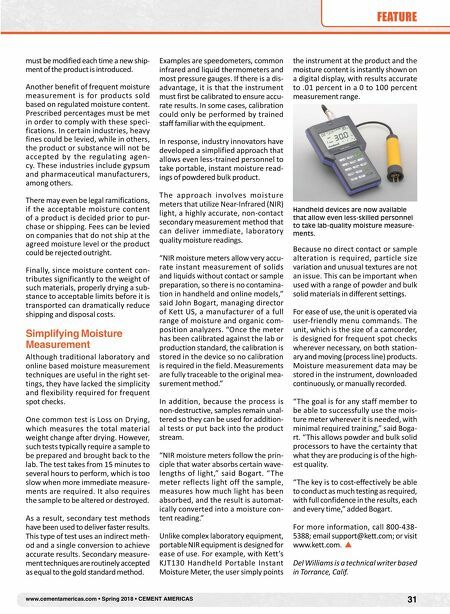 Otherwise, the product's time in the dryer, the dryer temperature, the conveyor belt speed, and many other factors Simplifying Moisture Measurement Instantaneous, "Point-and-Measure" Handheld Analyzers That Can Be Operated by Virtually Any Technician Deliver Lab-Quality Moisture Readings in Seconds. By Del Williams It is also important to know the precise moisture content in any raw materials prior to beginning the manufacturing process.